We were very lucky today to have a special visitor to help us with our topic, Florence Nightingale. Kirsty is a a Senior Sister at Wexham Park Hospital, she talked about her training and her role in the hospital. She told us that one of the most important jobs in any hospital is to keep it clean for the patients and staff. 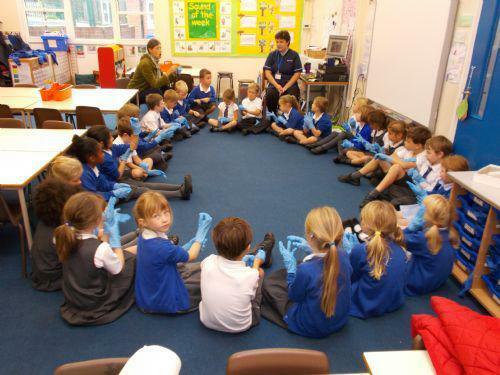 Hospital staff use gloves or a hand gel which smelt really strong to ensure our hands are clean. 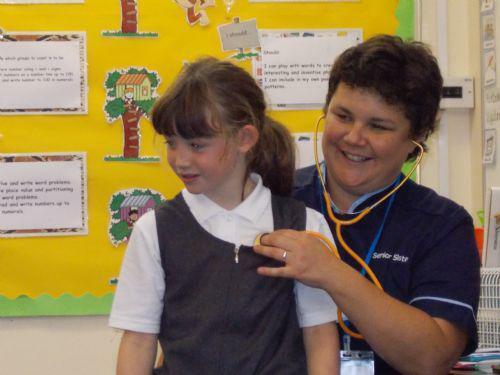 Zoe brought in a stethoscope and Kirsty listened to her heartbeat, Amy then listened to Kirsty's heartbeat and made the sound that she could hear. We then found our pulse on our wrist. We really enjoyed the visit from Kirsty and it has helped us to understand how important Florence Nightingale was in changing nursing to what it is now.